Raveena Tandon seems to look ageless. As she was getting ready for a shoot, the actress looked as gorgeous as she did 22 years ago when she started her career. 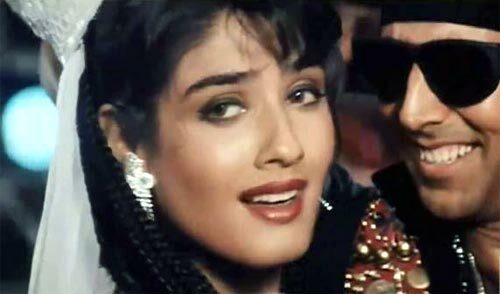 Raveena was in Film City, in the western suburb of Goregoan in Mumbai, shooting an ad for Seven Seas cod liver oil. Make-up artiste Ojas Rajani, who has worked with top stars in the film industry, was applying the finishing touches on her while an assistant was blow-drying her hair. After taking a career break to have children, the actress has returned to her showbiz career, and is as busy as ever. Besides doing two films, she is also hosting the popular television show, My Life, where she coaxes celebrities to reveal their innermost fears and ambitions on screen in the presence of their dear and near ones. Raveena spoke to A Ganesh Nadar about her life and career, and the lessons she learnt. You have a filmi background, with your father an acclaimed filmmaker. You starred in many films, and then suddenly vanished. Why? There is a right time for everything. There was a time when I wanted to settle down and have a family. I wanted to give time to my kids. I had worked for nearly 19 years when I got married. So, it was time to put my feet in the air. Relax a bit and enjoy my pregnancy. I had my babies and enjoyed time with them. I did not want to rush from studio to studio when my kids needed me at home. I really enjoyed that time. After Buddha Hoga Tera Baap, have you signed any other movie? I have actually finished two movies. One is called Gina Asmaan and the other is Shobana's Seven Nights. They are in the post-production phase. Are you involved with the scripting or planning of the TV show you are doing, My Life? No, not at all. I am only the host of the show. The show is produced by NDTV. Editing, scripting everything is theirs. I have to bring out the best in the guest and to link the whole show. Sometimes, it feels like you are asking extempore questions, not scripted ones. That happens all the time. I go with the flow. It's not one guest we have; we have 20 of them together and we don't know what they are going to say. So I have to play it by ear and keep it flowing. We don't know what the guests will say and so one has to be spontaneous and link the conversations so that it flows as one whole story. It feels very good that they still call me the Mast Mast girl. Sometimes they call me Kammo because that song (Mera Dil Le Gayi Oye Kammo Kidhar from Ziddi) was a big hit too. When you did the Mast Mast song, did you realise that a decade later we would still be listening to it? Honestly, no! It was just another song and I remember I fainted during the song. I had just come from Kulu Manali. We were shooting in the snow there. I drove down to Delhi and took a flight to Mumbai. I went straight from the airport to Filmistan. The temperature was 35 degrees and the studio lights added to the heat. It must have been 40 degrees inside and there were no AC studios then. From the snow to this, my blood pressure dropped and I fainted on the sets. It was a very hectic dance routine. If today you had to choose a Mast Mast girl, who would it be? I think Kareena (Kapoor) has that personality and pizzazz, she has that bindaas attitude. Tell us about your relationships. You have been in the industry for long, you are very good looking, how do you deal with break-ups and the after-effects? That's a very general question. These things are not planned. People fall in love when they are working together constantly. Today, even girls in college are dating but the problem for us is that in this industry even if you want to date someone, you cannot. The minute you are seen with the same person twice, you are finished. The media blows it out of proportion and kind of strangulates the relationship. The growth in the relationship is stopped immediately. It is too much pressure on the relationship. When you really want to get to know somebody you really can't. There are hits and misses and then you reach where your destiny wants to bring you and the path you follow. How do you deal with the break up, the emotional break-up? There are lots of ways to deal with it. Thankfully, I have not had a break-up in a long time (laughs heartily). And I don't intend to. Are you talking about the past? The past is mmmmm!!!! Quite a break-up! Sometimes you have got to know what's good for you and believe me, six months down the line you realise that it was good you broke up. So it took you six months to get over it? Ah... you know something, what you are talking about happened 15 years ago. I don't remember anything of that now. You are a mother and in showbiz, how do you divide the time between the two? I am constantly on the phone instructing people to do things for the kids. I kind of multi-task, I try and space out my work. The past four months I have been working a lot and this is not the way I intended to work. I wanted to do one film at a time. But you know what happened. I had signed two films. The first film got delayed and finally both the films came together. Then there were endorsements and the NDTV show. I have decided that once the NDTV show gets over, I will not sign a film till October. I have been reading scripts but I don't think I am going to sign any of them. I will take a three or four month break. If I start something, it will be in October-November. My daughter is seven and my son is four-and-a-half. I really want to be around them. Their studies and everything else is important to me. Do you have plans for your kids' futures, that they will be doctors, engineers or actors? Nowadays you cannot plan anything for kids. It's their life and they will decide. I will always be there to guide them about what is right and what is wrong, what mistakes they could be making, but ultimately, it's their decision to do what they want to do. There is no better teacher than life itself. You are the best lessons you learn from life. I have grown up learning from my life. I will leave the option to them about what they want to do with their lives. How important is money in your life? Money is important when I want to give my kids a good life. For me, individually, as a person, I don't really care. If God took away everything I have, I would go abroad and work in MacDonald's and take care of myself. It doesn't matter to me. Money is important to me to give my kids the kind of life I want to give them. Any movie you have regretted doing? No. There are some movies that did not turn out the way I expected. When you hear the script you expect something, but when the movie is made, it turns out to be something else. But what has to happen will happen however much you try to prevent it. I don't regret it. You cannot see the future. I don't do a regular programme. I walk twice a week on the treadmill. If I do something regularly, my body gets used to it. So I have to do something different. I always exercise differently every time. If you do the same exercise every day, the body gets used to it. With me, it is different. I have to shock-start my body every time.